In the final entry of our "Blood, Sweat and Cheers" series, former Blackhawk and current Comcast SportsNet analyst Steve Konroyd discusses the impact of top defensemen Duncan Keith and Brent Seabrook. Duncan Keith and Brent Seabrook are certainly among the elite defensemen in the National Hockey League. They would be that even if they weren’t playing together, as they’ve proven on the occasions when they were split up. But the fact that they are almost always paired together is a tremendous situation for the Blackhawks and for the two of them. They’ve been together for a while, starting out as kids in the organization, and they could be together for another 10 years or so. It’s not imperative that a defenseman plays with the same partner all the time, but it surely helps. 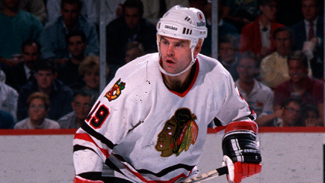 When I was in Chicago, I played almost 300 games with Keith Brown, and it was as though we always knew where the other was on the ice and what he was going to do. Duncan and Brent have that chemistry, and they use it to a huge advantage. Playing with each other is almost second nature, and the fact that they are such close friends off the ice doesn’t hurt, either. Billy Reay was a "Cagey Mentor"
If you watch Duncan and Brent play, you can see how they communicate. They talk a fair bit, for one. If one of them has the puck and the other yells “wheel,” that means take off with it. Or one of them might yell “reverse.” They not only know each other’s moves, they know each other’s voices. Their instincts are amazing, and on top of that, their styles complement each other. Dunc can jump up on the play and join the offense; Brent is pretty happy to stay back and take care of the house. That said, Dunc is so quick that he doesn’t get himself in trouble very often, and if he does, he’s so fast that he can turn on a dime and catch up with a guy. Brent, meanwhile, has a great shot, a heavy shot, and he can be part of the offense whenever the situation calls for it. You saw that the year the Blackhawks won the Stanley Cup. You saw it in last spring’s playoff series against Phoenix. You see it often. He probably sacrifices some of his offensive ability when Dunc is moving the puck up the ice, but that’s another part of why Seabrook is so valuable. Plus, he’s obviously a physical presence. Brent doesn’t fight very often because he doesn’t have to. The word is out around the NHL: He can handle himself. They both have skill sets that would make any general manager or coach drool. Dunc and Brent play on the power play and the penalty kill, and they log a lot of minutes every night. They’re both in tremendous shape and they’re both terrific guys. I’m not in the dressing room, but I’m guessing that Brent is more of a talker than Dunc is. They’re great leaders by example, and if you’re a young defenseman like Nick Leddy, you can learn so much just by watching how they handle themselves, when they’re playing and when they’re not. One thing Dunc and Brent do better than anybody else is break out of the zone. Dunc might poke check the puck away in the corner, then pass to Brent in front of the net. Teams don’t expect that. Normally, teams are clogging the boards, so you have a guy open to skate it out or pass it out. If you get a chance to play with one of them, like Nick did with Brent for a brief time last season, that’s another education in and of itself. I remember asking Seabs how he liked playing with Nick, and he said it was good. He said Nick has a lot of talent, plus he doesn’t yell at him as much as Dunc. That’s another example of how well Brent and Duncan get along. They’re almost like a couple that’s been married for a while. I’m sure they give each other the needle all the time. I saw another side of Dunc when he was a rookie. He came over to our house for dinner, and he was asking all sorts of questions about how a locker room works — camaraderie, team spirit, things like that. He’s a really bright young man. And, by the way, one of the slowest eaters I’ve ever seen. He’s lightning on skates but not with the fork and knife. Both Duncan and Brent are real character guys. They just don’t come any better. We’ve almost become spoiled by how reliable they are. Think about what they experienced in 2010, as kids, still 20-somethings. First, they win gold medals for their country at the Winter Olympics in Vancouver, where they both live during the offseason. Then they win a Stanley Cup in Chicago. Then, Duncan wins the Norris Trophy as the best defenseman in the NHL. At that age, you could lapse into believing that you’ve done it all. Talk about a career year…what they did in 2010 was a great career, period. But those guys are not the type to become complacent. For one, they came up to the Blackhawks at a time when the team was down, and there were maybe 7,000 fans in the United Center for games. So they were there when hockey wasn’t what it is now in Chicago. They were there when the team wasn’t making the playoffs, let alone winning a Cup. So I’m sure Duncan and Brent remember what is was like. I’m sure also that they appreciate what they have now. They don’t want to see what it was like before again, and they will do whatever it takes to keep the Blackhawks as contenders every year. Don’t forget: They’re still young, but Keith and Seabrook have been around here longer than every other player on the roster. We make a lot about the minutes they play, but if you play like they do, it gets you in a rhythm. You want to be out there for almost half a game. Plus, Head Coach Joel Quenneville is very good about giving his team days off, or certain guys “maintenance days” when they don’t have to skate. Dunc and Brent are hard workers, and, like I said, they could be doing this or doing it even better for years to come. I don’t know why they wouldn’t want to play their entire careers in Chicago. It’s the best city in North America, you have the best owner in sports in Rocky Wirtz, an unbelievable organization and thousands of loyal fans. Where else would you want to play hockey?